SoulCycle, the New York-based cycle studio that entered the Atlanta market with a studio at the Shops Around Lenox in Buckhead last May, has signed a lease for a second Atlanta location, according to sources familiar with the transaction. The new SoulCycle will open along North Avenue at Ponce City Market in Old Fourth Ward. The addition of SoulCycle further cements Ponce City Market's reputation as a "millennial playground." According to sources familiar with the deal, the new SoulCycle will open in a portion of the current Binders space along North Avenue, between City Winery and eyewear retailer Karoo. Binders, which sells art supplies and frames, will consolidate their operations in a smaller space, according to permits recently filed with the City of Atlanta. The current 10,000 square foot space will be reduced by about half to allow for SoulCycle to open and create an additional, approximately 2,000 square foot space. The Buckhead SoulCycle is about 3,100 square feet and the Ponce City Market outpost will be similarly sized. Building permits filed earlier this month with the City of Atlanta indicate that about $300,000 will be spent to create the new space(s). 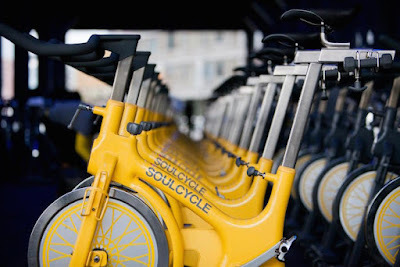 Referred to as the original indoor cycle fitness studio, the first SoulCycle opened in New York in 2006. The company was acquired by Equinox Fitness in 2011. Rival cycle studio Flywheel was launched by SoulCycle co-founder Ruth Zuckerman in 2010. Flywheel entered the Atlanta market in 2011 with a location on West Paces Ferry Road. In the years since, the chain has grown locally to include locations in Midtown and Alpharetta. The Buckhead studio, which insiders say was the second most profitable unit in the entire company, relocated in 2016 to The Shops Buckhead Atlanta. There are currently about 90 SoulCycle studios nationwide. Securing a lease with SoulCycle is a coup for Ponce City Market owner Jamestown who had reportedly been in talks with Flywheel years ago but never finalized a deal. SoulCycle joins existing fitness offerings at Ponce City Market, The Forum Athletic Club and Core Power Yoga. Elsewhere in Atlanta, local studios like Torq Cycle (West Midtown) and TURN (Sandy Springs), as well as chain operators like CycleBar (multiple locations), have tried to emulate the sense of community and success enjoyed by SoulCycle and Flywheel. Like Flywheel and Barry's Bootcamp, SoulCycle has built its business on expensive classes paired with premium apparel and other goods often branded with the fitness company's name. SoulCycle, for instance, currently offers a SoulCycle x lululemon exclusive apparel line in addition to their core offering, intense 45 minute classes for $30. As it nears 100 studios in North America (plans call for at least one studio in London this year), SoulCycle could revisit its IPO plans which it started in 2015 but officially shelved last year. An employee at the Buckhead SoulCycle location indicated that the plan as of now is to have the Ponce City Market location open before the end of the year. Are you excited for the addition of SoulCycle to Ponce City Market? What is your favorite fitness studio in metro Atlanta? If SoulCycle continues to expand in metro Atlanta, where would you like to see them open next? I use to take spin classes in the early and mid-2000's under Ruth Zuckerman when she was an instructor at the old Reebok Club (now Equinox) at Lincoln Center in NYC. Super nice person and great instructor. Don't know what caused the fall-out with her former partners at Soul Cycle, but hope Flywheel stays successful. PCM is THE worst location for regular workouts. I had a free class pass to Core Power and could not bring myself to pay for parking or circle around in hopes of finding free parking. Unless you live in the development, the parking situation is a real hinderance. substitute "eating and/or shopping" for "regular workouts" and that's the same way I feel about PCM. I went there once just to check it out and haven't been back.